Muratec MFX-C3690 Multifunction Color Copier (manufactured by Konica Minolta). Muratec America, Inc. is a wholly owned subsidiary of Konica Minolta Business Solutions, U.S.A.
A conveniently positioned, easy-to-use, 9-inch LCD supports comfortable multi-touch operation. 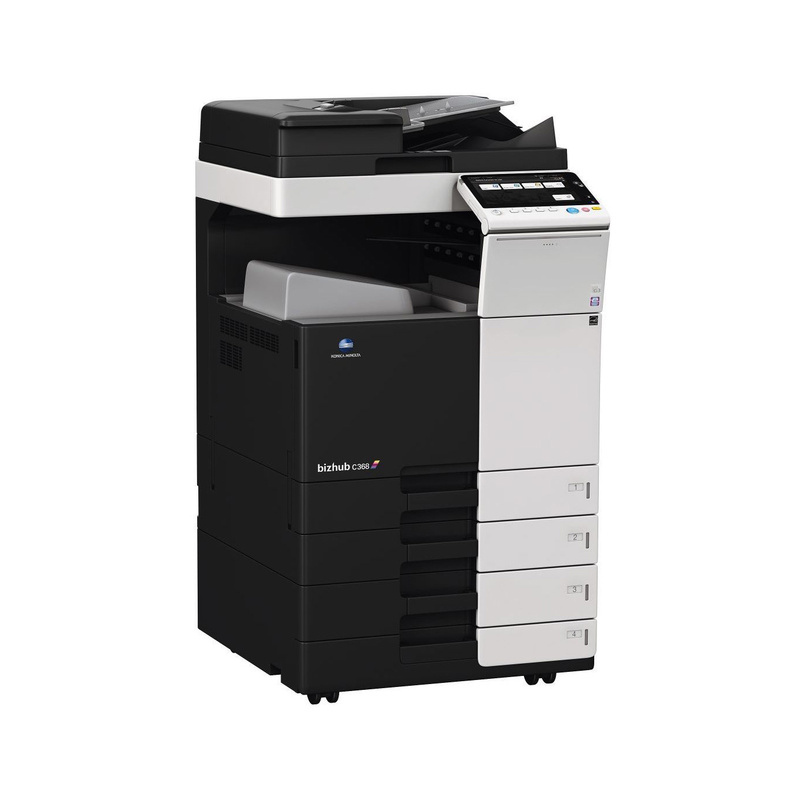 Konica Minolta bizhub C368 series users will get up to speed as quickly as they would with a smartphone or tablet. Those devices can also be used to easily link with the mobile touch area. Moreover, sophisticated, easy-to-use operability is one of the other distinctive features. Long-awaited connectivity with cloud services and mobile devices will suit today's new work styles. Enjoy using the operation panel or smartphones to scan data, and share in the cloud. Choose any data in the cloud to print remotely. A smartphone can be used as a remote control. The standard universal trays have a total capacity of 1,000 sheets. And there's more - the maximum capacity can be raised to 6,650 sheets with options. A multifunction finisher that would definitely help your workflow can be added - with stapling, punching, tri-folding, booklet binding and more. A high-level security function will protect your privacy and prevent leakage of important information. The standard authentication allows you to restrict users, limit the functions available to each user and manage usage to protect your information. Additionally, IC card and biometric authentication are available for even higher security. Versatile functions and comfortable operability support diverse needs. For example, screen display colour reversal and language changes can be done with a simple operation. Every supportive detail, such as the display of a soft numeric keypad only when needed, helps make operation more comfortable. All-round environmental conservation is a priority in bizhubs. Lower TEC values and CO2 emissions contribute to excellent environmental performance, and recycled materials are used in many parts of the main unit. Complying with environmental standards in respective countries surely makes sense.